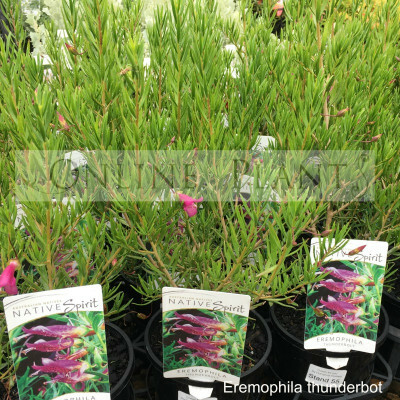 Eremophila Thunderbolt is A long flowering, very resilient tough little native shrub growing to a height of 1-2 meters. It has delightful soft blue/purple flowers in summer and sporadically through the year. Can be trimmed as needed, but will keep a reasonably compact shape regardless. Summer mulching will help it retain a lush green appearance, otherwise, it is very drought hardy. Also, frost tolerant. Will benefit from feeding twice per year with native plant food. Buy Eremophila Thunderbolt from Online Plants Melbourne. Australia's largest online retail Nursery. Over 3000 species of plants.